First things first; if you own a cattery, veterinary practice or run an animal welfare group and want to add your organisation to the directory, please click ‘Register’ on the main navigation menu to find the right page. If you are a company involved with cat-related products or services, and are interested in being a sole advertising sponsor for this website, we would like to hear your proposals. This website was not created as an advertising platform, but to provide useful information for cat owners. However, we are interested in finding a single site sponsor / advertiser to help us pay the bills. We can only accept advertising proposals for products or services which relate directly to our users and which do not conflict with the interests of the catteries and vets listed in the directory. We are looking for long-term sponsors with a minimum 12 months’ commitment. If you are interested in associating your brand with our website, please use the links below to send us details of your proposal. We’re primarily interested in advertising from companies offering products or services which mightbe of interest to UK cat owners, which will include things like pet foods, petcare products, toys, pet insurance and so on. 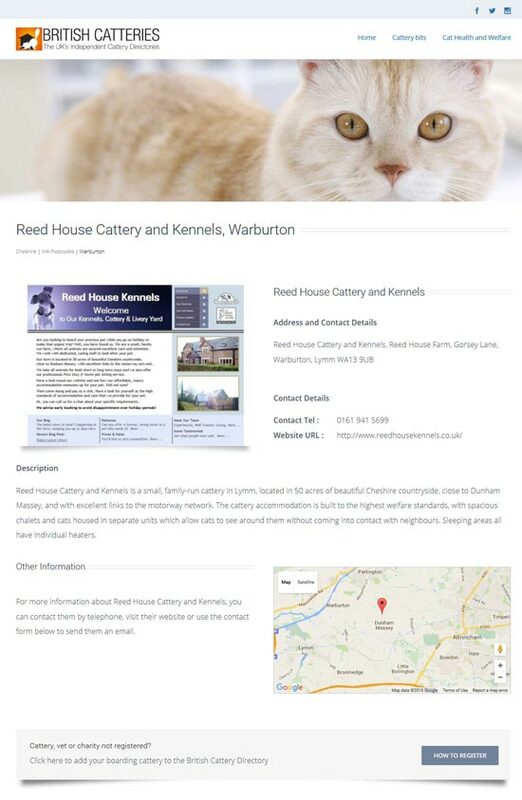 In addition to the British Cattery Directory, we are also open to sponsorship advertising for our British Kennels Directory and our Pet Welfare website Adoptable’.co.uk. Our feeling is that our ‘Adoptable’ website is particularly suitable to advertising by veterinary groups. We are only interested in discussing sponsor advertising from companies open to a minimum 12 month commitment. We are aware that this is not how most advertising is planned. Any advertising will be a one-off arrangement and we do not have a rate card, so please don’t ask for one! Please tell us who you are, what you want to do (the more information provided, the better), and what you are willing to pay, and we will consider your request on that basis. Looking to advertise your cattery, vet or rescue centre? If you want to add your cattery, veterinary practice or a cat welfare organisation to this website, go to the top of this page and click ‘add your business to the directory’, or scroll to the bottom of this page and choose one of the ‘How to register’ links. You cannot do it from this page. Thank you! Interested in advertising in the British Cattery Directory?